blueberries, cherries and peach pie. We had an array of exotic pies! The rains couldn't stop our 16th Annual Peach Pie contest from being held on Saturday, August 4th. Bakers, spectators, and judges all braved the downpour, the thunder, the potential that the rain would make our plethora of peach pies soggy bottomed affairs. No, we braved the elements and took up our forks in pursuit of tasting the best peach pie of the 2018 season. And man, where there pies! 4 in the Classic Just Peach Pie category and a whooping 9 entries for Peaches Plus. I took a bit of video to share so you could see just how much rain with which we had to contend. At one point before the start of the contest, we covered the pies on hand with tinfoil, pie pans, and our own umbrellas. This year we had plenty of judges on hand who were willing to fill their bellies with all things peach-pie. As in previous years, we split up into two judging teams - some of us were tasters for the 4 Classic Peach entries, the rest of the judges were tasked with tasting the 9 Peaches Plus entries. The big winner this year was Pie #3, as baked by Natasha Zirbel, of Collingswood, NJ, took top prize for best presentation pie and best tasting classic pie. Natasha is a baker who has entered pie contests in previous years, placing but never winning. This was her year to shine, winning top prize for Presentation/Best Looking Peach Pie. Her stained glass-inspired top pie crust wowed us with its clever design and perfect golden brown crust. Natasha told me she's won 4 times for presentation, so she clearly knows what she's doing! Adding to her arsenal of blue ribbons, Natasha's Peach Schnapper Pie also took first place in best Classic Peach Pie. 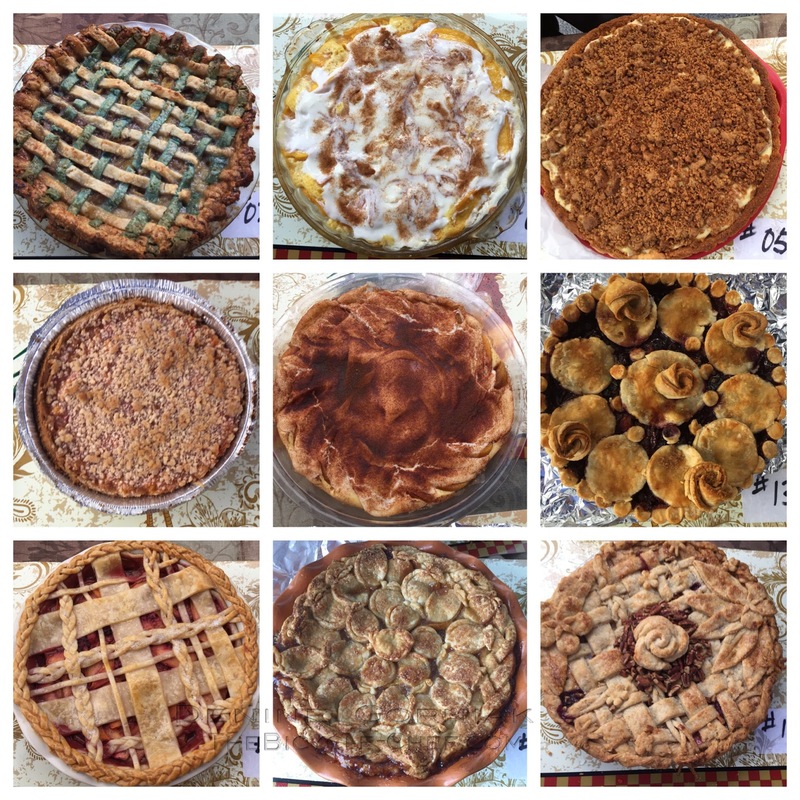 Coming in 2nd Place for Presentation in the Classic Peach pie variety was #12, baked by Jacqueline McLean, who comes to our Farmers' Market all the way from Broomall, PA! She called her pie, Daisy Violet's Jersey Fresh Peach Pie. It was perfectly set, with a sweet boozy punch from a generous splash of bourbon. That's my kind of pie! Long-time baker and winner, Jane Walker, of National Park, NJ, never fails to bring a beautiful pie to the Market's contest. Her entry, Pie #1, called A Slice of Peach Heaven, was indeed heavenly. What with its amazingly intricate layered lattice design and floral motif, Jane's pies are always stellar. Her pie took 2nd Place in the Traditional judging. Sorry, Jane! I'm using your photo from the Salsa contest because I didn't snap your photo on Saturday! Third Place for both Presentation and Best Tasting Traditional Peach Pie went to Pie #10, baked by Sally A. Castellini, Vineland, NJ. Sally sent her elegant pie , the Summer Daze Peach Pie, to the Market contest via her friend, who's name I forgot to write down! I have her photo, so I'm sharing that here! Anyone who stuck around long enough to have their photo taken gets a spot on my post! I loved this pie, it's simple design and perfect bite. I wanted this pie to win big; it just needed to be warm for it to have been bliss! Onto the Peach-Plus Winners. There were so many pies! Even though I was a judge for Traditional Peach Pies, I still had sample the pies in this category. I needed to know how they tasted and be ready for my full report! Coming in 1st place for Peach Plus was #5, baked by Maya Kong. She has entered in previous years so she too knows a thing or two about baking a good pie. Maya's, Tropical Peach Passion Tart, had a crumb-top which hid a bounty of fillings inside. Her peach plus included: pudding, passion fruit, guava, and a hint of orange blossom water. 2nd Place Peaches Plus went to Pie #13, baked by Sowmya Ledalla, of Voorhees, NJ. Sowmya is a first-time baker! For real! Her entry, Pied Peacher, was the first pie she ever baked. It was filled with peaches, blueberries, cherries, topped with pie rounds and pie rosettes. Sowmya used exotic spices by adding cardamon, which pairs well with peaches, and in a surprise twist, a pinch of paprika! 3rd Place Peach Plus, Pie #15, baked by Chiya Stonehill, Collingwood, NJ (formerly of Wilmington, DE) Her home-spun pie, Chiya's Bourbon and Brown Sugar Peach Pie Delight, was topped with cut out ovals and a braided crust included hints of ginger with that brown sugar and bourbon. Chiya is another one of our bakers extraordinaire. She's entered the apple pie contests in the past and has won for her baking expertise. This was her first year entering a peach pie. Now, I'll share two of my favorites that were so fantastic I almost made a piglet of myself sampling forkfuls. Pie # 4, baked by long-time pie baker and Farmers' Market Friend, Linda Sauerwine, of Collingwood, NJ. I'm crazy about this pie. If memory serves, Linda baked a similar pie last year that I called a Pie-Caken. This dreamy and creamy number, rightly called, the Peaches 'n Cream Pie, had a luscious cream and cinnamon topping. Under which there were layers of peaches and a tender, cake-like cobbler. This pie might not get a second look but it deserved more glances and a lot more tastings. Great job, Linda! What's your secret recipe? Care to Share? Pie # 11 - another simple and homey pie in the Peaches Plus entries, was baked by Darlene Throckmorton, of Haddon Township, NJ. It too was a Peaches and Cream Pie. The generous cinnamon dusting covered cream and peaches that were layered in tender crust. I wish I had a piece of this right now, all this reviewing is making pie-hungry! Congratulations to all of bakers - another fine year! 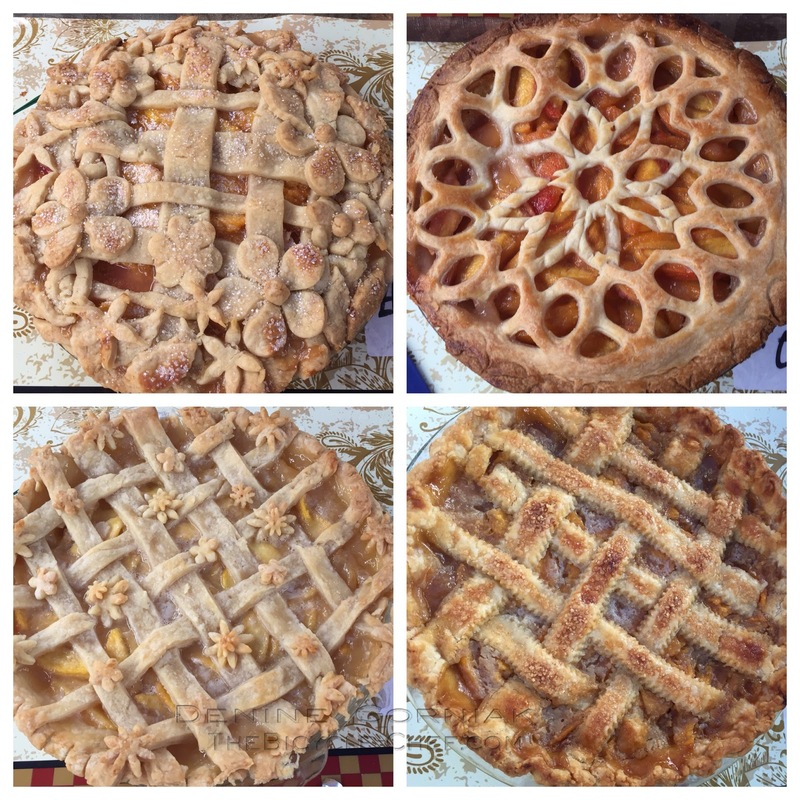 We are so proud to have these other fine bakers enter the 16th Annual Peach Pie Contest: Erica Young, Collingswood - the Peachini; Anna Moss and Kit Mason, by way of Wolverhampton, UK and Wilmington, DE (but hoping to move to Collingswood!) - Peachy Keen Sweet Nectarine Pie; Aylsa L. Drennan, Blackwood, NJ - Everything Peachy; Emily Thompson, National Park, NJ.